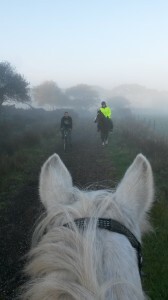 Minister urges local authorities to allow equestrian use of cycleways. £5 Individual or £7 Family per annum. Membership runs April to April. We offer free guidance and advice to all members of the horse riding community where they have encountered difficulties in accessing a public right of way. We have fought tirelessly to gain better access to existing rights of way and to ensure that horse riders gain fair and equal treatment. We have proved, through massive research of existing and long standing multi-use rights of way, that horse riders do not constitute a hazard to other users. We are affiliated to and work with the BHS, and fully support the multi-use policies of Devon County Council. We work in full co-operation with cyclists and walkers recognising our common interests in achieving safe off-road rights of way. Over the last few years we have been responsible for the creation of several new bridleways. We act as consultees to public bodies when new rights of way are proposed or there are proposed changes to existing ones. With greater membership we have a greater voice.